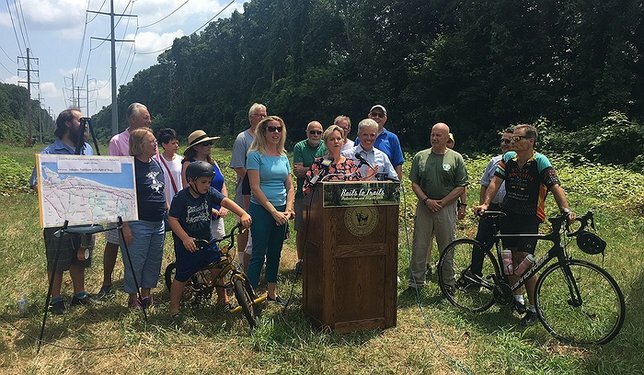 Suffolk County Legislator Sarah Anker joined Suffolk County Executive Steve Bellone, Suffolk County Legislator Kara Hahn, local bicycle organizations and community members at the bill signing to approve the bonding of funds to advance the Rails to Trials recreational path. Shoreham, NY - July 30, 2018 - On Friday, July 27, Legislator Sarah Anker joined Suffolk County Executive Steve Bellone for a bill signing event approving the bonding of funds to advance the Rails to Trails recreational path. The bill, which was overwhelmingly approved by the General Legislature in a bi-partisan effort, authorizes the bonding of $8.82 million for the path, 94% of which is reimbursable through federal grant funds. The Rails to Trails project is a 10-mile, multi-use recreational path that runs along the former Long Island Rail Road right-of-way. The trail route runs parallel to Route 25A, from Mt. Sinai to Wading River. The design will incorporate the new Tesla Science Museum in Shoreham, as well as the many parks, businesses, and schools adjacent to the trail. The project is funded by approximately $10 million in total, $9.5 million of which is federal grants that have been specifically allocated to the construction of multi-use trails. The project has received extensive community support and support from numerous clubs and organizations, including Friends of the Greenway Trails, New York Bicycling Coalition, Vision Long Island, and Concerned Long Island Mountain Bikers (CLIMB). The Suffolk County Department of Public Works and Legislator Anker are currently working with these and other local groups on maintenance agreements to assist in upkeep of the trail. In addition, Legislator Anker continues to seek private funding for additional privacy fencing and landscaping along the trail. The trail is currently in the design phase awaiting final review and approval by the New York State Department of Transportation. Suffolk County anticipates breaking ground on the construction of the trail in 2019 and completion in 2020. Subject: LongIsland.com - Your Name sent you Article details of "Legislator Anker Joins County Executive Steve Bellone at Bill Signing for Rails to Trails Project Funding"